Navalny was immediately remanded into custody after the verdict was read out, along with his accomplice Ofitserov, who got 4 years in prison. Both Navalny and Ofitserov said goodbye to their wives. “He and us, we were prepared for it – to the extent that one may be able to prepare for things like this,” Yulia Navalnaya said. She added that despite the isolation, Navalny is planning to carry on with the anti-corruption activity. Ofitserov is a father of five children, and his wife, crying in court, said goodbye to her husband. 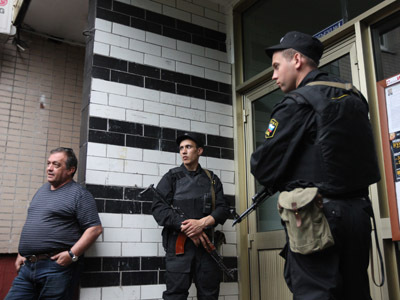 Both Aleksey Navalny and Ofitserov have been transported to a detention facility in Kirov. The reading of 100 page document took more than three hours, with the judge asserting the court’s decision wasn’t politically motivated. 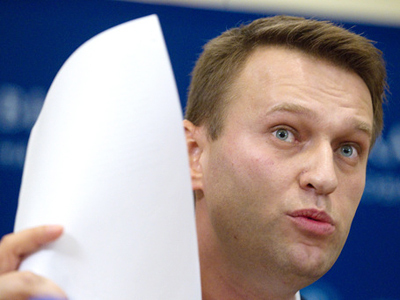 The court ruled that Aleksey Navalny and Ofitserov, caused 16 million rubles ($500,000) in damages to the state-owned Kirovles timber company where Navalny worked as a volunteer in 2009. Navalny's lawyers say they are going to appeal the verdict, which they must do within the next 10 days. 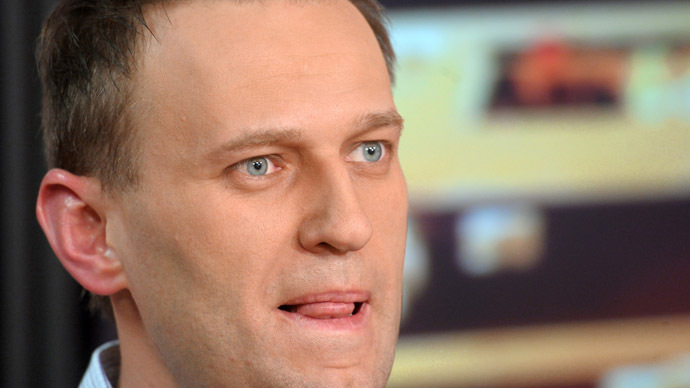 Navalny had previously said he might drop out of Moscow’s mayoral race if convicted, his electoral team said. 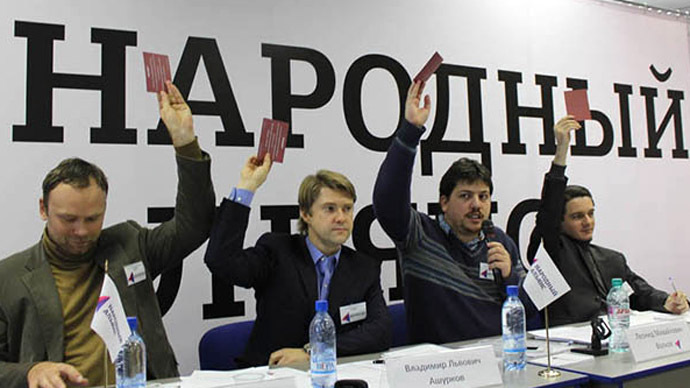 The team’s head, Leonid Volkov, said that they are going to address the Moscow election committee shortly. However, they still plan on organizing protests and a boycott campaign against the upcoming September poll. 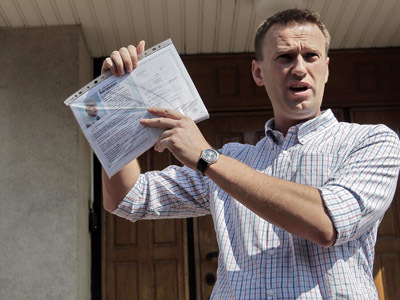 The Moscow election committee stated that despite the verdict, Navalny remains a registered mayoral candidate by law. The supporters of the opposition leader gathered outside the court, holding banners criticizing Russian authorities. More rallies are planned across the globe for on Thursday, including calls to gather in the center of Moscow. 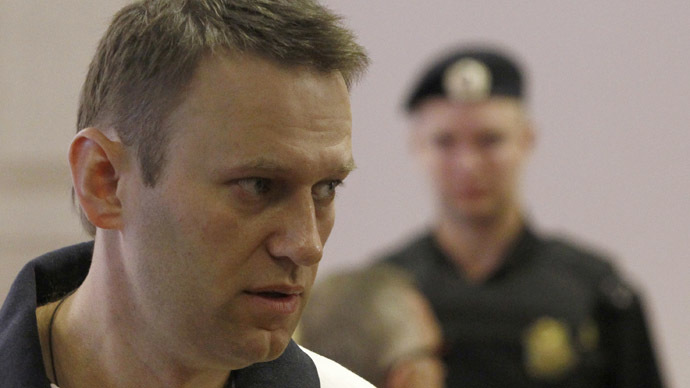 Navalny stood trial on charges of embezzling property from the state-owned Kirovles Company in 2009, which is located in Russia’s central Kirov Region. At the time Navalny worked as a volunteer aide to Kirov Governor Nikita Belykh, who was tasked with reforming the region’s industry. The prosecution said Navalny ordered Ofitserov, whom the court deemed to be his accomplice, to set up an intermediary firm and then persuaded Kirovles director Vyacheslav Opalev to sign a contract with the company on unfavorable terms. 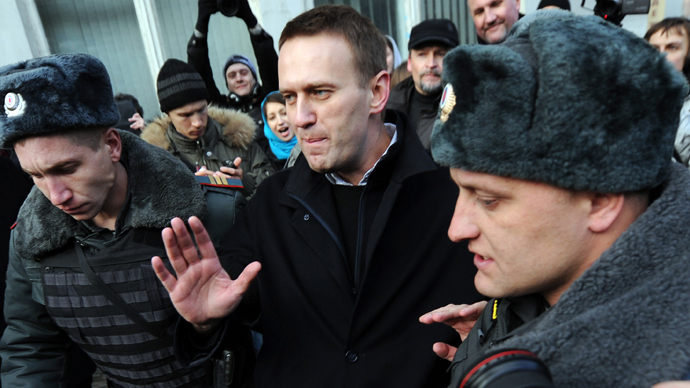 Navalny has been standing trial over embezzlement of property from the state-owned Kirovles company, in the central Russian Kirov Region, that took place in 2009. Back then the would-be whistleblower worked as a volunteer aide to Kirov Governor Nikita Belykh, dealing with reforms of regional industry. The prosecution said Navalny ordered Ofitserov, called his accomplice by the court, to set up an intermediary firm and then persuaded Kirovles director Vyacheslav Opalev to sign a contract with the company on unfavorable terms. 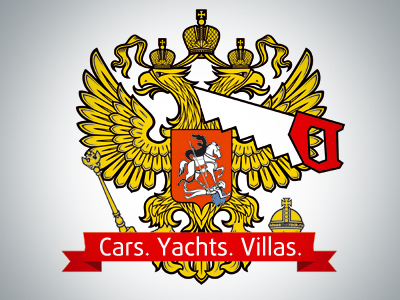 The overall damages to Kirovles amounted to 16 million rubles, according to a law enforcement estimate. 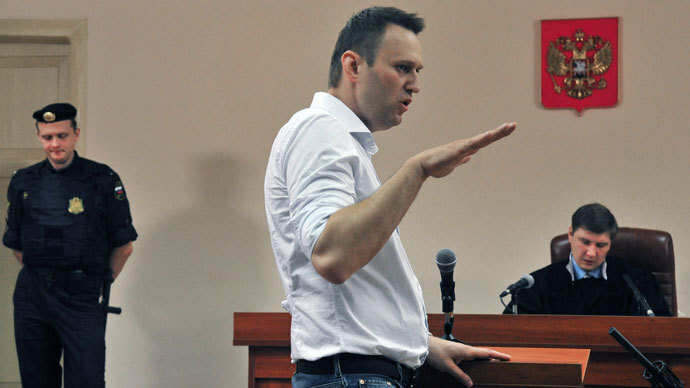 Navalny and his defense adamantly denied the charges, saying that as a voluntary aide for the governor he had no leverage to persuade state executives to make such significant decisions, and that the court failed to prove that he actually benefited from the scam. The anti-corruption blogger had repeatedly called the case against him fabricated and politically motivated, claiming it was an act of revenge by the Russian authorities over his disclosure of state corruption schemes - along with his high-profile participation in the Russian opposition movement. Navalny pointed to the fact that the Kirovles case, which had been shuttered twice before due to a lack of evidence, re-opened less than a week after he accused Investigative Committee chief Aleksandr Bastrykin of being a foreign agent, alleging the chief investigator held a residence permit in the Czech Republic. He also claimed that Opalev, the main witness against Navalny, agreed to testify against him and Ofitserov in exchange for a softer sentence. Opalev has already been tried for his role in the case, and was given a four-year suspended sentence. The defense also blasted the court’s refusal to summon witnesses they claimed could prove Navalny’s innocence; the judge ruled that the lawyers failed to clarify the relevance of their testimonies. Nevertheless some of the witnesses voluntarily appeared at the hearing backing up the main defense line and claiming Navalny and Ofitserov fell victim to bureaucratic chaos in Kirovles. Maria Gaidar another former governor's aide, confirmed that Navalny as an aide could only “advise” the governor, while Belykh himself claimed Navalny did not cause any financial damage to the region during his service. Aleksey Navalny is a 37-year-old Russian lawyer and a political activist who has gained tremendous media popularity, especially in Western media, since 2009. He is known for publicly criticizing the administration of Vladimir Putin and the level of corruption in the country. He was also instrumental in organizing numerous sanctioned and unsanctioned protests in the Russian capital, leading to his and his supporters’ repeated arrests. In his earlier political career as an acting Deputy Chief of the Moscow branch of the social-liberal Yabloko party, Navalny made headlines by supporting the ultra-nationalist 2006 Russian March, which Yabloko condemned as a program of “fascist, Nazi, xenophobic manifestations" - a sentiment shared by many other media outlets and NGOs. This led to his exclusion from Yabloko the following year. The unofficial reason for his discharge, however, was his alleged attempt to overthrow the party leadership. In 2007, Navalny became one of the founders of the Nation nationalist movement. In 2008, Nation was incorporated into a vaguely structured coalition of far-right groups known collectively as the Russian National Movement. It ceased to exist in 2011. Besides being well-known for his populist but nationalistic political outlook, Navalny is also famous for his political blog which was used to organize mass demonstrations in Moscow during the parliamentary elections in December 2011 and presidential elections in March 2012. But he really rose to fame in 2010 with the launch of the Rospil project, which quickly became notorious for disclosing alleged corruption by government officials. 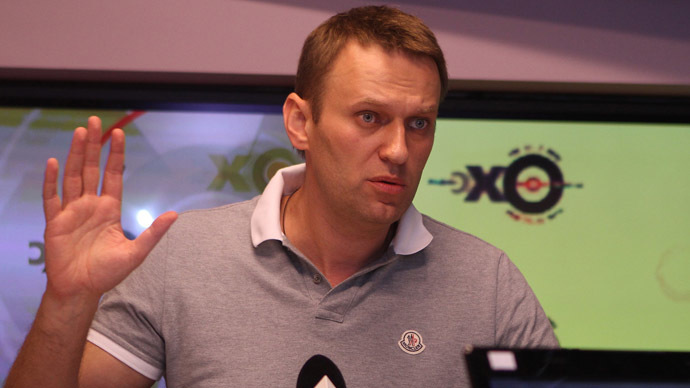 Navalny used online channels to publish confidential information about oil pipeline giant Transneft's auditing, exposing what appeared to be a multi-million dollar theft during the construction of an Eastern Siberia – Pacific Ocean oil pipeline. Further whistleblowing activity followed, earning him popularity in social media and the press. Navalny was also the man who coined the phrase “party of crooks and thieves,” which became a ubiquitous nickname in opposition circles for the country's ruling United Russia party. Navalny was one of the key figures in organizing numerous sanctioned and unsanctioned meetings in the Russian capital, which led to his and his supporters’ arrests when tens of thousands protested in Central Moscow's Bolotnaya Square over allegations of election fraud in parliamentary elections that were won by United Russia, led by then-prime minister Vladimir Putin. 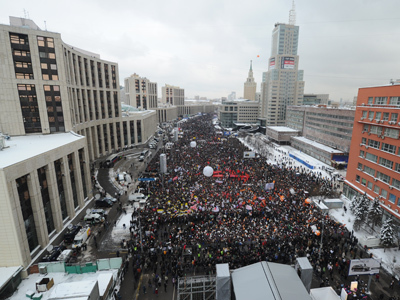 The protest, organized by numerous opposition groups and featuring various movement leaders, attracted around 6,000 members of what is now known as Team Navalny. Police arrested some 300 people as the blogger headed an unsanctioned protest over the Russian elections at Moscow's Triumfalnaya Square. For his role in the protests, the 37-year-old was sent to jail for 15 days. On his release from custody he publicly urged Russians to vote against the candidacy of Putin in the upcoming presidential election in March 2012. Four days later, December 24, he led another 50,000 people in an anti-government rally. “I see enough people to take the Kremlin right now,” Navalny shouted to his supporters. 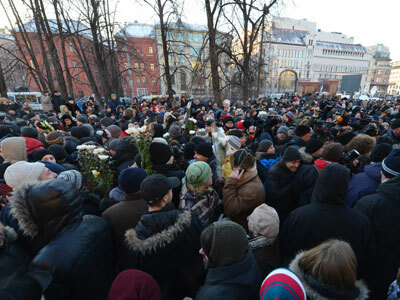 After the presidential election in March, Navalny organized another anti-Putin rally in Pushkin Square, attended by as many as 20,000 people. There he was also detained for questioning for several hours but eventually released by the authorities. Gaining political support, he led another anti-government rally on 8 May, a day after Putin's inauguration. 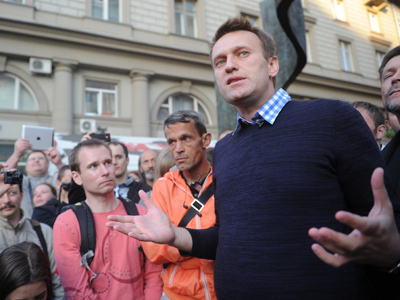 Navalny and the opposition's leftist faction's leader Sergey Udaltsov were apprehended by the authorities after a gathering at Chistye Prudy. 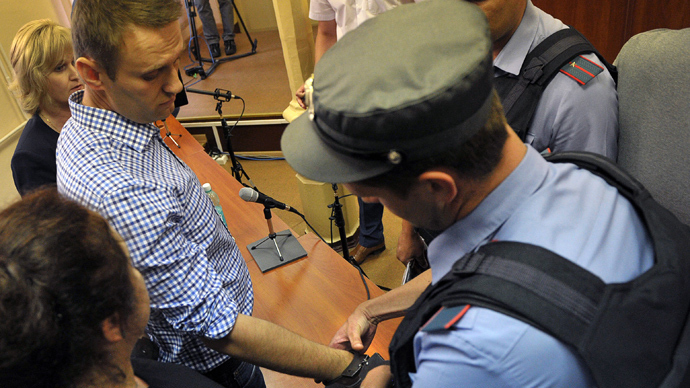 Navalny was once again sentenced to 15 days in jail. While being exceptionally determined to reveal alleged corruption schemes, at the same time, Navalny is extremely secretive when asked about his own sponsors and allies. Navalny does not officially belong to any political party, but is being backed by the People’s Alliance party, which pronounces its ultimate goal as “bringing Russia closer to European civilization.” Earlier this month the Justice Ministry ordered a temporary suspension of the party's registration. In April, during a nationwide Q&A session, Russian President Vladimir Putin stressed he had told prosecutors and other law enforcers to ensure the trial is objective. “There should be no illusions like when someone is calling for everyone to catch a thief, giving this person a license to steal. But this also does not mean that someone whose views differ from those of the authorities must be put on trial and dragged to prison,” Putin said.